VATICAN CITY (Reuters) - Pope Francis on Friday urged predator priests who have sexually abused minors to turn themselves in, making one of his strongest comments ever on the crisis sweeping the Roman Catholic Church. While it was not immediately clear if Francis was saying such priests should surrender to the Church judicial system, civil justice, or both, Vatican sources believed it was the first time the pope had made such a direct appeal. "To those who abuse minors I would say this: convert and hand yourself over to human justice, and prepare for divine justice," Francis said in his Christmas address to the Curia, the Vatican's central administration. 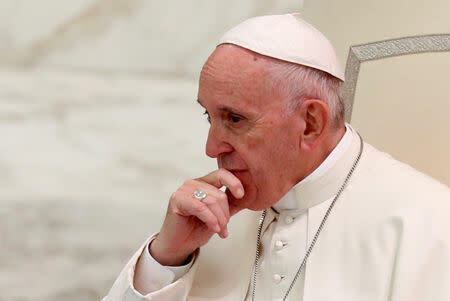 He spoke two months before a summit on the sexual abuse crisis that will be attended by the heads of some 110 national Catholic bishops' conferences and dozens of experts and leaders of religious orders in the Vatican. Francis has previously used the Christmas address to denounce cases of corruption and mismanagement in the Curia. This time, he concentrated on the global sexual abuse crisis. "Let it be clear that, faced with these abominations, the Church will spare no effort to do all that is necessary to bring to justice whoever has committed such crimes. The Church will never seek to hush up or not take seriously any case," he said. When the pope has made similar promises of zero tolerance in the past, victim groups have scoffed, saying the Church has to come up with a clear policy to make bishops themselves accountable for the mishandling of abuse cases. Anne Barrett Doyle, co-director of BishopAccountability.org, a group that tracks abuse cases worldwide, said the pope's words on their own did nothing to protect children or deter abusers and the Church had to come up with real changes at the conference. "Let's hope that he's working now on a host of concrete systemic reforms that he plans to present soon to a horrified and grieving people," she said. In his address, Francis acknowledged that the Church had made serious errors in handling the crisis in the past in the past. Earlier this year, Francis himself first strongly defended a bishop in Chile who had been accused of covering up abuse, only later to launch an inquiry and accept the resignation of that bishop and other prelates there. "It is undeniable that some in the past, out of irresponsibility, disbelief, lack of training, inexperience, or spiritual and human short-sightedness, treated many cases without the seriousness and promptness that was due," he said, without referring to the Chilean cases.